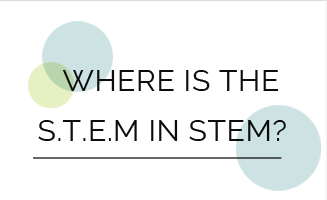 The STEM School Study (S3) seeks to understand the landscape of inclusive STEM high schools across the United States. S3 examines how STEM schools define themselves, the strategies they use, and the student experience. What do STEM schools do? How do STEM schools work? Where is the S.T.E.M. in STEM? How are inclusive STEM schools alike? Problem-based learning (PBL) and student interest in STEM careers: The roles of motivation and ability beliefs has been published in Education Sciences. PI Melanie LaForce and Co-PI Liz Noble presented findings from S3 at the NSTA Area Conference in New Orleans, LA. The eight essential elements of inclusive STEM high schools has been published in the International Journal of STEM Education. PI Melanie LaForce will present an invited session at the Magnet Schools Assistance Program (MSAP) Project Directors Meeting in Washington D.C.
PI Melanie LaForce presented a featured session at the NSTA Area Conference on STEM Education in Minneapolis, MN. PI Melanie LaForce and Co-PI Liz Noble presented findings from S3 at the NSTA STEM Forum & Expo in Denver, CO.
PI Melanie LaForce presented on S3 at Discovery Education’s First Annual Summer STEMmersion in Chicago, IL. PI Melanie LaForce and Co-PI Jeanne Century presented at the LASER STEM Education Leadership Institute in Lynwood, WA. PI Melanie LaForce presented at the GE Foundation’s 2015 Summer Conference, “Bridging the Gap: Success for Tomorrow with STEM Skills Today,” in July. Co-PI Jeanne Century presented at the LASER STEM Education Leadership Institute in Lynnwood, WA. In Belgium, the Flemish Department of Education will utilize S3’s 8 Elements framework in the development of their support and co-learning strategy. PI Melanie LaForce presented at the Central Ohio STEM Leaders Summit in Columbus, OH, hosted by Reynoldsburg City Schools. PI Melanie LaForce presented at Battelle for Kids’ Educators Connect for Success Conference in Columbus, OH. Co-PI Liz Noble, Heather King, and PI Melanie LaForce presented on the 8 Elements of STEM High Schools at the NSTA STEM Forum & Expo in Minneapolis, MN. The S3 team produced an informational video on the project for CADRE’s 2015 Teaching & Learning Video Showcase. The S3 team worked as advisors to the Utah State Office of Education, which is using the 8 Elements as the foundation of their STEM Schools Designation program. The S3 project was featured on the front page of NSTA’s Science and the STEM Classroom newsletter. Findings from S3 were featured in a story in UChicago News. 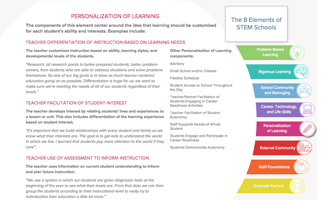 We identified 8 Elements common to STEM schools across the country. Here, you can see the Elements that make up STEM schools, as well as examples of how they are enacted by S3 schools. The Elements are made up of components that represent the core of what STEM schools do every day to accomplish their goals. Explore all 78 in our infographic of STEM school components. 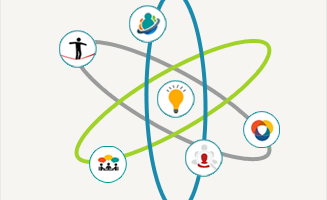 The STEM School Roadmap is an interactive visual that demonstrates how the components work together to achieve the goals of STEM schools. On this page, explore the Roadmap and read about how it was developed and how you can use it. What happens in STEM school classrooms? We visited 134 classrooms in our study schools to understand what instruction looks like in STEM schools. These findings share the different strategies and classroom behaviors we observed. In our work with STEM school leaders and stakeholders, it has become clear that they may define "STEM" as more than science, technology, engineering, and math. Read about how these disciplines fit into the S3 framework. And how do they differ? We interviewed school leaders at all 20 participating schools to find out what the most essential parts of their schools are. 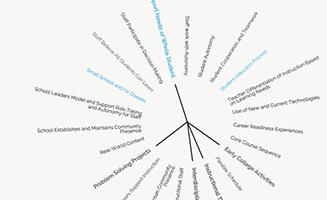 Explore visual representations of each school’s model here. Technology plays an important role in STEM schools. In classroom observations and interviews, we examined the types of technologies used and the ways students interact with them. Read those findings and examples from teachers here. One goal of inclusive STEM high schools is to broaden STEM participation, and students’ STEM attitudes play an important role in doing so. 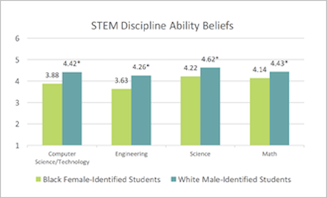 Here, we look at differences in STEM-related attitudes across races/ethnicities and genders. In recent years, many states and schools have embraced a STEM focus. However, there is much debate and uncertainty about what a STEM school is. This study seeks to develop a clear, comprehensive understanding of inclusive STEM schools across the nation, as well as how the various strategies and methods employed by these schools can relate to real student outcomes. This study is funded by the National Science Foundation. The fundamental goal of all Outlier projects is to provide schools and policy makers with useful, timely information to continually improve. In S3, we work hard to maintain open communication and work in collaboration with our schools. In addition to sharing our broader findings, we provide schools with detailed, school-specific findings from each questionnaire administration. Schools have also worked closely with us to articulate their models, and we encourage feedback on our work throughout the research study. To see more of Outlier’s STEM school work, visit our Projects page. What are the essential components of each inclusive STEM school’s model? Which of these are unique to particular STEM schools? Which are common across the STEM schools? Which of the components are applicable to schools in general, and which are specifically STEM-oriented? What is happening at inclusive STEM high schools? What is the status of implementation of the intended components of each STEM school’s model? What affects STEM school practices? What factors (contexts and conditions) contribute to or inhibit the implementation of essential components? 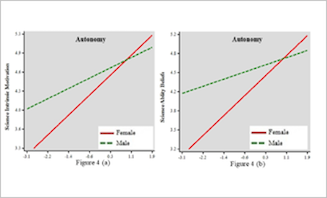 What components are most closely related to desired student outcomes in STEM schools? Do the relationships change in different contexts? Do the relationships change over time? What are the specific relationships between instructional practice components of STEM school models, contexts and conditions, and student outcomes? Your browser can't display the map. S3 is a mixed-methods study. We use quantitative and qualitative strategies to answer our core research questions. 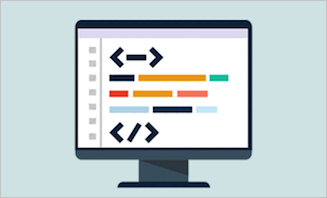 To understand the essential components of schools, we use a detailed interview and coding process. To measure the implementation of essential components, we use teacher, student, and school leader questionnaires. These questionnaires were developed in earlier STEM school research, and have been refined in S3 to precisely and reliably measure how schools implement strategies and practices. We get a richer portrait of essential component implementation through our qualitative data collection. In 2014 and 2015, we will visit several of our schools to see their essential components in action. We will observe activities and classes, talk in depth to teachers and students, and generally learn what it means to be a part of an inclusive STEM high school. To understand student outcomes, we work with schools each year to collect student-level achievement data (student GPA, test scores, and other data when available). We link questionnaire responses to school-provided data to understand how different essential components and patterns of implementation may be related to student achievement. In addition, we are working on a post-graduate questionnaire for a sample of students who have graduated from participating schools. These questionnaires will help us understand how post-grads reflect on their STEM experience and feel that it has helped prepare them for life after high school. 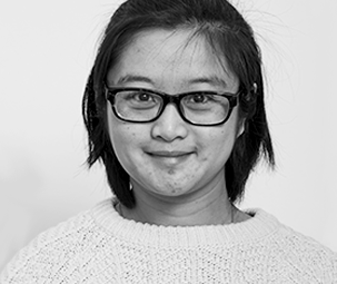 Melanie joined Outlier Research & Evaluation in July 2011 and works on a range of research and evaluation projects. 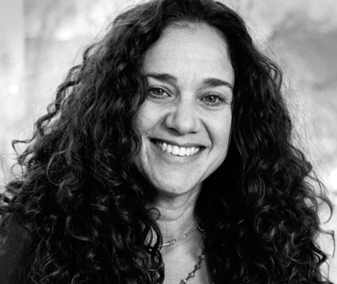 Prior to her work at the University of Chicago, Melanie worked as a quantitative researcher at the Chicago Postsecondary Transition Project, a joint project between the Consortium on Chicago School Research and The School of Social Service Administration at the University of Chicago. She has also previously worked as a research analyst at Chicago Public Schools in both the Office of Math and Science and the Department of Postsecondary Education. She received her PhD in Social Psychology from Loyola University and holds a BA from Ohio University. 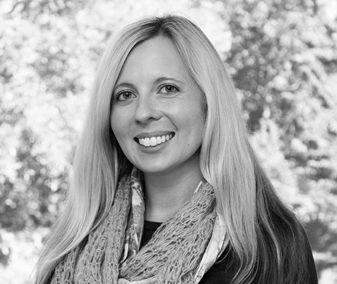 Liz has a variety of experience as both a researcher and an educator. 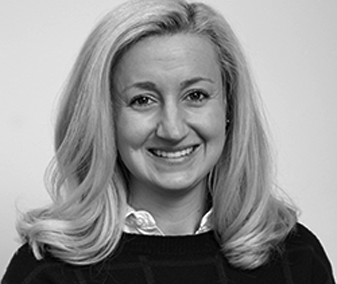 Prior to coming to Outlier Research & Evaluation, Liz worked as Research Assistant at Northwestern University, and with the Chicago Children's Museum on an exploratory study of the Museum's early learning-focused Pritzker Playspace. She is also a trained Montessori teacher and taught in a three to six year-old classroom for several years. Liz has an M.A. in Learning Science from Northwestern University and an undergraduate degree in Psychology from Denison University. Prior to coming to the University of Chicago in 2005, Jeanne Century was a Senior Researcher at Education Development Center (EDC) in Newton MA. Jeanne has a BA in general science from Brandeis, and a MEd and doctorate in science education curriculum and teaching from Boston University. Her research focuses on the impact of inquiry science instruction, strategies for improving utilization of research and evaluation, sustainability of reform efforts, and measurement of intervention fidelity. Century served on the Education Policy and Department of Education Agency Review transition teams for the Obama-Biden administration where she was responsible for STEM education and education research and development issues. 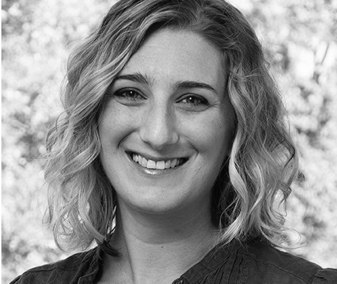 Katie joined the Outlier team in March 2017 after completing a post-doctoral fellowship and Research Assistant Professorship at the Institute for Applied Research and Youth Development at Tufts University. She is currently working on several projects including the S3 and Broward County STEM + C research projects. Her previous work focused on program evaluation of positive youth development outcomes in out-of-school time contexts, particularly those positive outcomes youth receive through participation in sports and Boy/Girl Scouts. She received her Ph.D. in Life Span Developmental Psychology from West Virginia University and a B.A. with Honors in Psychology from Muhlenberg College. Huifang joined Outlier in February 2017. Prior to this, Huifang worked as a Research Assistant in the Department of Computer Science, Center for Applied Geographic Information Science, Urban Institute, and Center for Educational Measurement and Evaluation at UNC-Charlotte. She received her PhD in Educational Research Methodology and M.A. in Geography Information Science from UNC-Charlotte. Huifang also holds a M.A. in the major of Language Acquisition and Chinese Modern Literature from Beijing Normal University. During her 7-year professional training, her research has focused on STEM education, neighborhood analysis in relation to mathematics achievement, self-efficacy, and learning English as a second language.